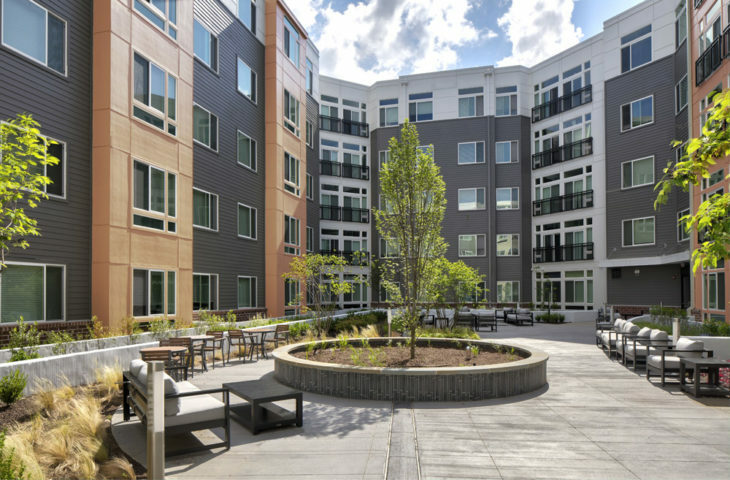 A five-story, 199-unit multifamily project with an attached six-story parking garage, the Crossings at Olde Towne building is wood construction with a façade of brick and cementitious panels; the garage is pre-cast concrete. 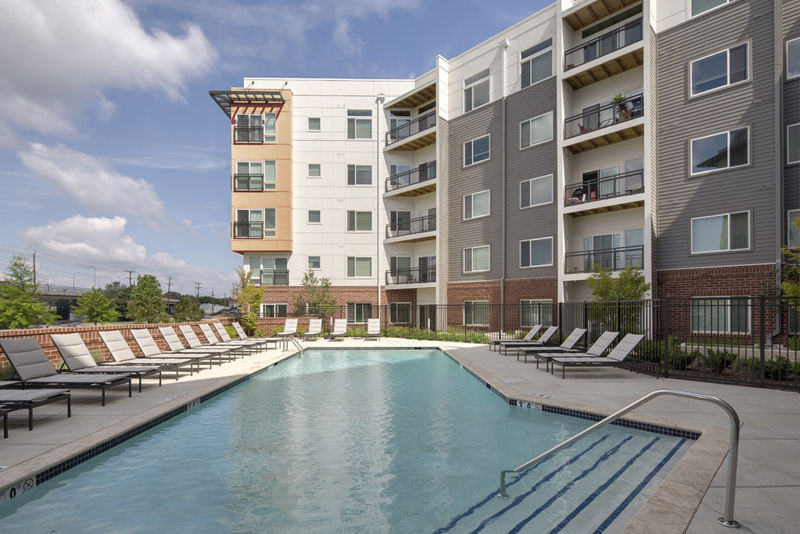 The project features a large variety of interior and exterior amenity spaces. 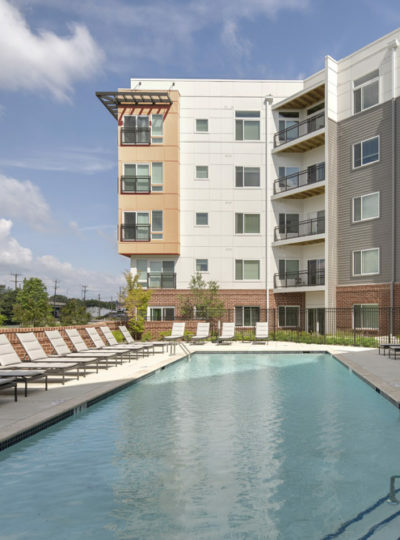 The exterior amenity spaces include two courtyard areas: one incorporates a pool, and the other has outdoor kitchens with several landscaped gathering spaces for residents. 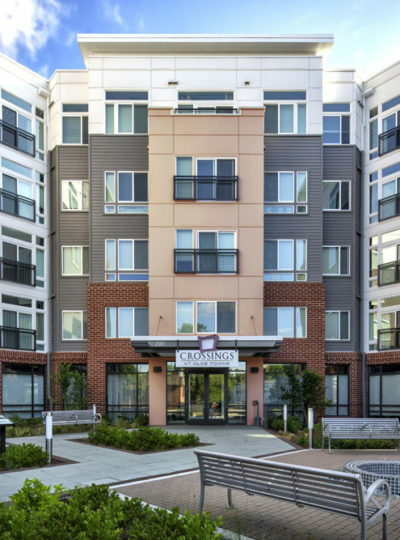 The design intent for the Crossings at Olde Towne was to provide aesthetic compatibility with the city’s other historical buildings, as well as to incorporate Gaithersburg’s railroad history. 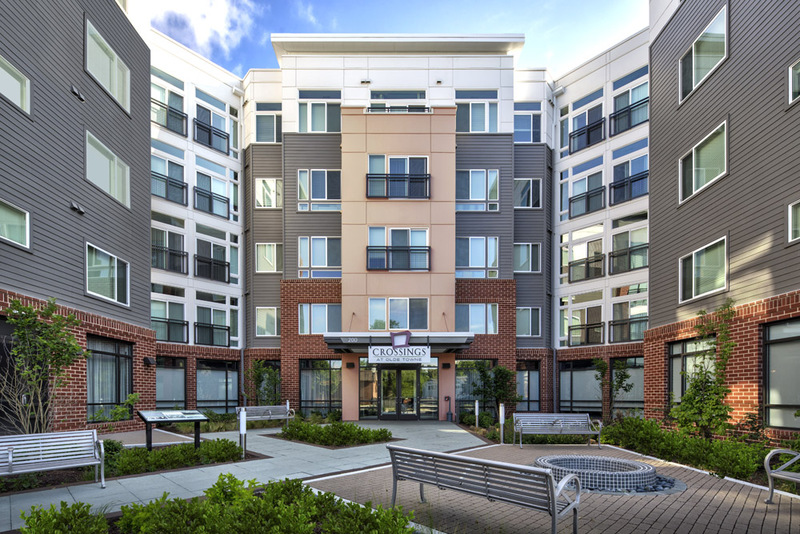 The front (south) façade is flanked by two towers, which not only emphasize the building’s entrance plaza but also create a gateway into Olde Towne Gaithersburg. 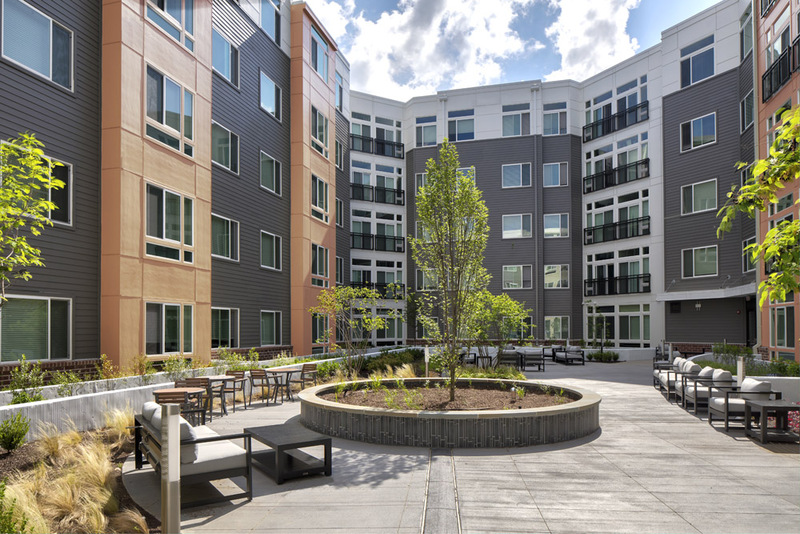 Projecting bays, each with large glazed openings and with its own accentuating color, define the building’s corners. The style of the rear (north) façade, which faces the CSX tracks, mimics that of an old northeastern warehouse typically found along railroad tracks in this region of the country. 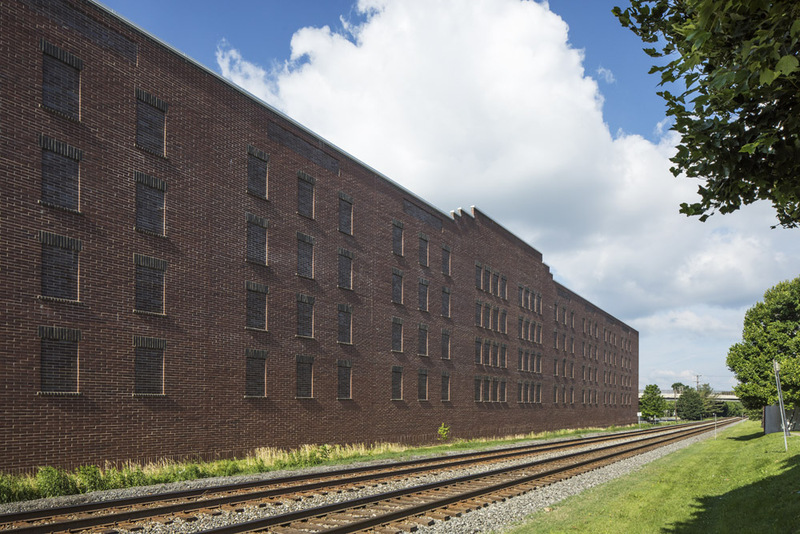 Because the rear façade is located only 30 feet from the CSX tracks, GTM had to do extensive engineering to soundproof the building. 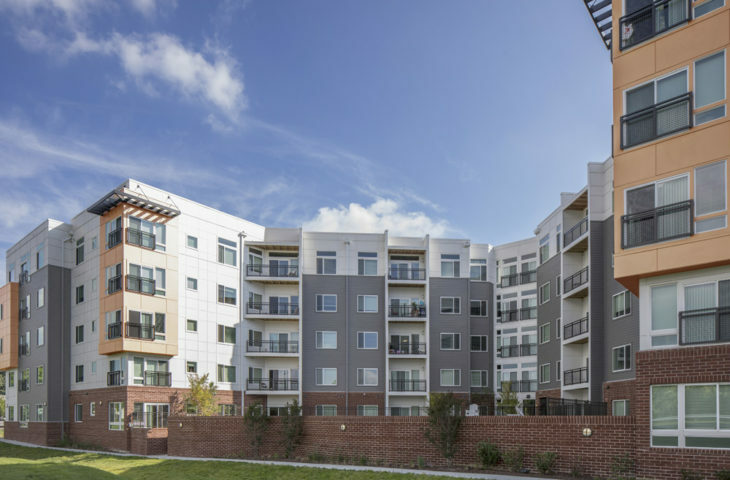 Throughout the entire design process, GTM worked very closely with the Historic District Commission of the City of Gaithersburg to ensure compliance with that organization’s requirements.